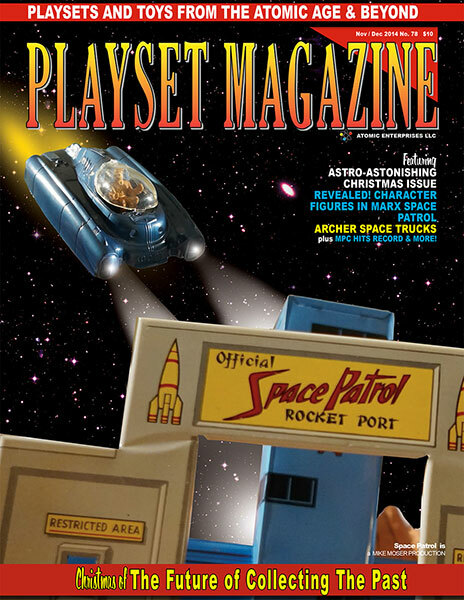 PLAYSET MAGAZINE ISSUE 78 - SPACE PATROL!! ISSUE 78 HITS MAIL: SPACE PATROL FOR CHRISTMAS! At this years’ OTS show, during the annual Shop With A Cop charity auction, Mike Kutnick announced he was going to “Make a speech” and proceeded to commend Playset Magazine on 13 years of service and reaching issue 78 -- the farthest any American plastics / Marx magazine has gone. He handed me a card - and I tried to make a small joke. But when Kath came over and opened the envelope, it was a card signed by tons of collectors and we were quite too tongue-tied to say a proper thank you. So folks, please accept this thanks now, to the many of you who signed and added all those kind words, and to Mike. We are deeply touched. Yes its true - some of you got double issues last time, an unexpected “2-for-1” special. Turns out it was a new mail handler at the mailing house, which has now gone in-house. This year the annual Old Toy Soldier Show was held on the last few days of the month, right on top of our publication schedule. We were able to cover the show and a new release or two, but time was tight and we’ll complete a few more reviews next issue. 1952 was an incredible year for television and competing in the realm of science fiction were not twp but three TV series of enormous interest and quality. Over on the DuMont Network Captain Video and his Space Rangers raged as over on CBS, Tom Corbett Space Cadet was a prototype “space” series, using lots of miniatures and effects. ABC showcased Space Patrol, lavished with a great cast, special effects and stories that really put much of our modern science fiction to shame especially in later episodes. Equally fantastic, then, is Marx’ “Official” Space Patrol playset, headwaters source for many figures and accessories used far into the future. The most amazing thing is how nimbly Marx intermixed figures and lithography from two of its top licensed properties, Tom Corbett and Space Patrol, allowing useful cross-pollination so that both shows could be marketed while still pleasing kid-aged cadet fans of both. The interstellar display this time is courtesy that master of terrain, Jim Clouse, and the mint set on the centerspread is courtesy Rick Eber's enviable personal collection. There were quite a few "grips and helpers" doing the display setup, too: Eric Koopmeiners, Craig Remington, Jim Clouse our Webmaster, Tom Lowzowski, and a few other spacemen including set meister Rick Eber and your humble editors. It was a blast. Also here are rare Archer Space Trucks, courtesy David Schafer, plus an in-depth "discovery" piece about one collector's discovery, back in the dark non-Internet early days of the hobby, of the Space Patrol Character figures which will make for fascinating reading. And in another article we ask, why exactly did those MPC spacemen go for so much? Mike Holverson has some sage collecting advice in his story, The Christmas Chase, and there is of course complete coverage of the fabulous OTSN Toy Soldier Show, and coverage of that spectacular new Roman Coliseum complete with gladiators Barzso Playsets, Inc, has just released. maybe that would be a good pick for your Christmas tree? And certainly with the seasonal plethora of holiday ads featuring many playsets, toys, accessories and figures, your Christmas Wishes will be granted. Let us take this time to wish all our readers a most wonderful Christmas. You have certainly brightened our doorstep with your very real presence in our lives and those of the staff here at Playset Magazine. And to our many contributors, staff and photographers and writers of Americas best continuing source of plastics coverage and entertainment, thank you. This is the time of year for us all to take a moment to reflect, be grateful, and thankful for our great families and country. We wish you the very best of the season, and may Santa bring you something to make your hearts grow warm and to fill in your collections! Until next year and our splendid plastic explorations together, Merry Christmas and Happy New Year!